Let Sport Court® Houston create the perfect Sport Court® multi-sport game court for your backyard… and give your kids a place to play that they will never outgrow. Contact us today for a free consultation or on-site estimate. Knowing where your kids are playing is very important these days, and Sport Court® Houston has been providing safe and secure multi-sport game courts since 1978. In a space that is as little as a quarter of the size of a tennis court, you can create family memories that will last you through grandkids. 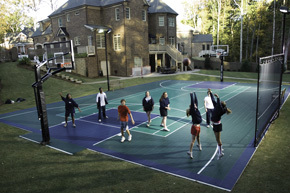 Sport Court® Houston will help you to design a multi-sport game court to fit your backyard and your budget. Give your family a reason to turn off the TV and the video games, raise the heart rate a little, and get outside and have some fun. 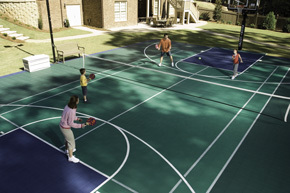 Sport Court® Houston builds multi-sport game courts for families in Houston.